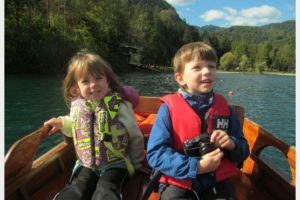 Interlaken with kids might be your favorite vacation ever (it was certainly right at the top of our list!) There are so many places in Europe that are frankly not very toddler friendly. Luckily, Interlaken is not one of them! The Bernese Oberland region is one of the best places to visit in Switzerland with kids because of the huge array of easy, kid friendly daytrips from Interlaken. There is at enough in and around this Swiss mountain paradise to fill an Interlaken itinerary for a family with for at least a week! 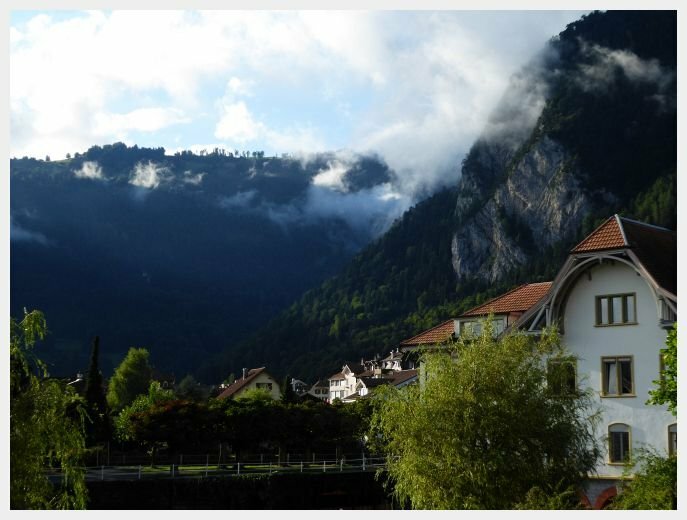 We stayed at an amazing, family friendly hostel in Interlaken. We recommend it wholeheartedly to ANYONE visiting the area. Interlaken was a perfect base for our family to explore the Bernese Oberland which truly showcases the very best of what Switzerland has to offer. This easily walk through the beautiful Aare Gorge yield stunning views. There is a playground at one end the kids can make a game out of finding little green worm characters that are hidden in the rock walls. I can’t take credit for this amazing find. 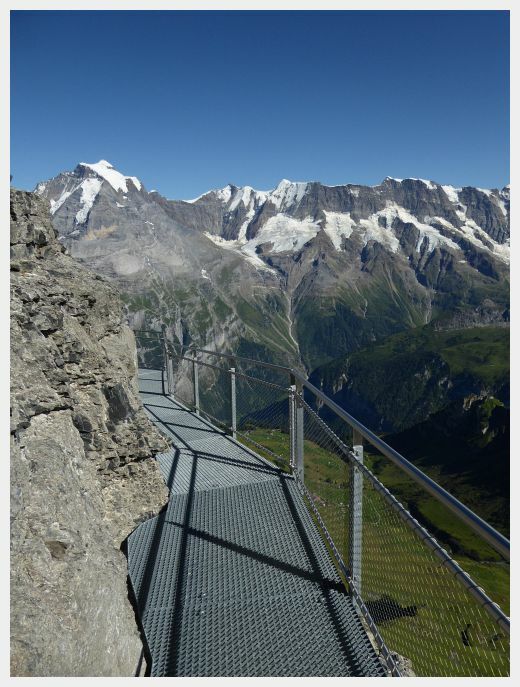 Check out the Moms, Tots Zurich Blog’s Aare Gorge Page for detailed instructions. 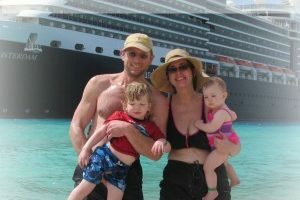 This area is awash with stunning scenery and fun stuff to keep the kiddos amused. The Grindelwald Cable Car will take you up to Grindelwald First where you will find a neat cliff walk and the start to the easy, stroller friendly hike to Lake Backalpsee. The Pfingstegg Cable Car takes you up a different way to access a summer toboggan run and a small playground. Glacier Gorge is also close. 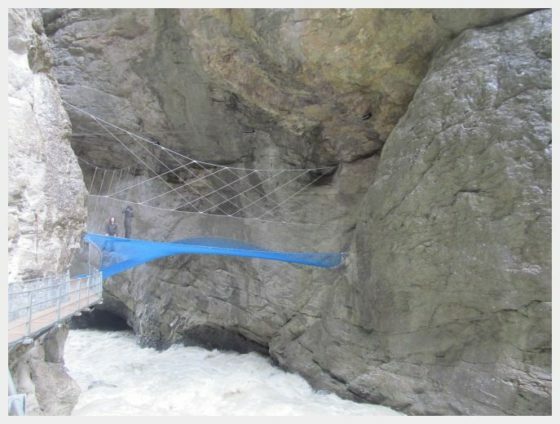 It offers an easy hike down a beautiful gorge with a neat “web” feature that you can crawl out on spanning the river below. The Glacier Gorge in Grindelwald was a great activity to do in Interlaken with kids. We went here on a rainy day and still enjoyed it a lot! The Lauterbrunnen Valley Switzerland is an area that we really would have liked to have spent more time exploring. Surrounded by epic mountains, this area has idyllic Swiss villages and lots of beautiful waterfalls to explore. The Trummelbach Falls hike from Lauterbrunnen is an easy pathway that leads to Trummelbach Falls. Trummelbach falls is a series of waterfalls that cuts through the rock to funnel the immense volume of glacial melt off from the surrounding mountains. Trummelbach falls might not be suitable for small children. It is extremely loud and somewhat dark, wet and slippery. This was truly one of our favorite days in Switzerland. Taking the cable cars to the top of the Schilthorn and exploring the village of Murren and the Allmendhubel Flower Playground at the top of the Allmendhubelbahn (funicular) was something that we all enjoyed. 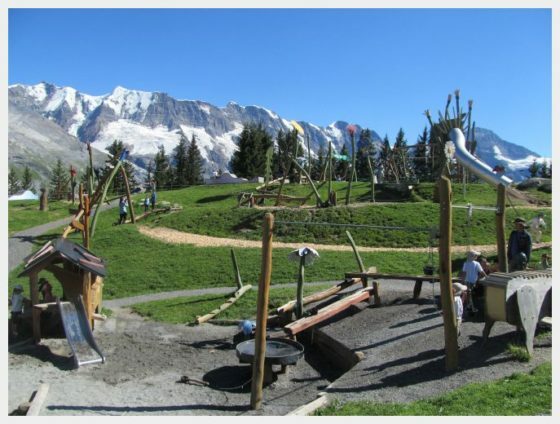 The Almendhubel Flower playground near Murren, Switzerland has to be one of our favorite playstops EVER. I mean, look at those views! As a bonus, a herd of beautiful Swiss cows wandered by while we were playing. Taking the funicular to the top of Harder Kulm in Interlaken was a surprise highlight of our trip. We ended up here on our last day in Interlaken because the weather was bad higher in the mountains. Harder Kulm is considered Interlaken’s “home” mountain. This is one of the best things to do in Interlaken Switzerland and truly one of the easiest! The viewing platform that extends off the side of the cliff giving you incredible views of both lakes is one of the best places to visit in Interlaken. The bottom of the funicular is an easy walk, right off of the main street in Interlaken. 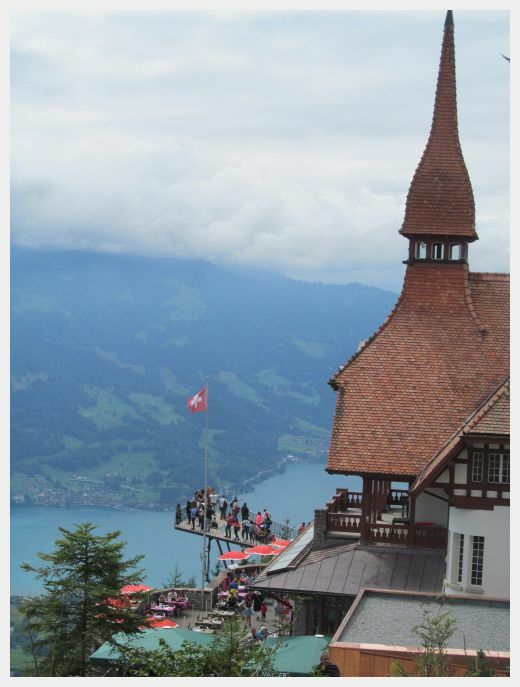 The views from the viewing platform of Lake Thun and Lake Briensz were unforgettable and there were a number of Interlaken hiking trails that are accessible from here. Note: The Interlaken Visitor Card that you will get if you are staying any Interlaken accomodations gives you a discount for the Harder Kulm funicular as well as a host of other great discounts! Harder Kulm is Interlaken’s home mountain. The funnicular leaves right from town. This is a great activity for a day when the weather higher in the mountains is foul. Thun Switzerland is a super cute and off the beaten path Swiss village at the opposite end of Lake Thun from Interlaken. You can either take the train or take a boat cruise across the lake (or do the cruise one way and the train the other.) 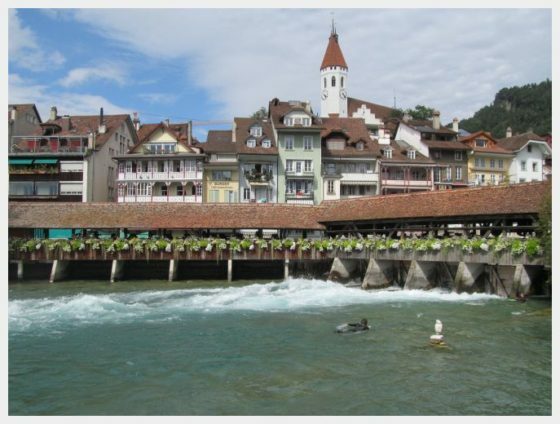 There are some great things to do in Thun Switzerland making it an easy daytrips from Interlaken. The adorable little town of Thun Switzerland was a great daytrip with the kids from Interlaken. This is a neat cave complex and series of impressive waterfalls not far from Interlaken. There is a captivating dragon themed playground, making this a good half day option for those looking for Interlaken activities with kids. 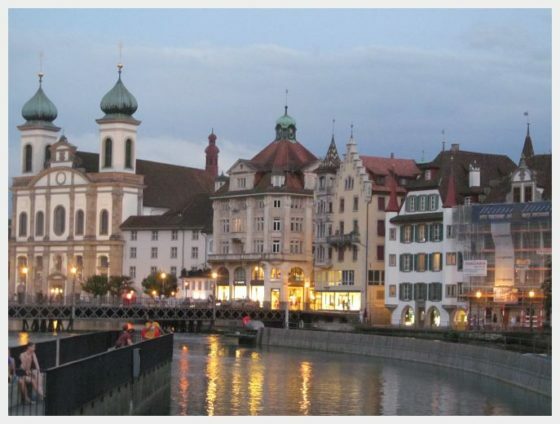 One could easily spend a few days in exploring Lucerne on its own merits. If all you have is a day, it is one of the most pleasant daytrips from Interlaken. You can either DIY this or book a tour for maximum convenience. The city and its iconic bridge against the backdrop of the mountains are a sight to see. Mount Rigi is even more impressive – this was one of our favorite days of our trip! Picture perfect Lucerne, Switzerland is an easy day trip from Interlaken! 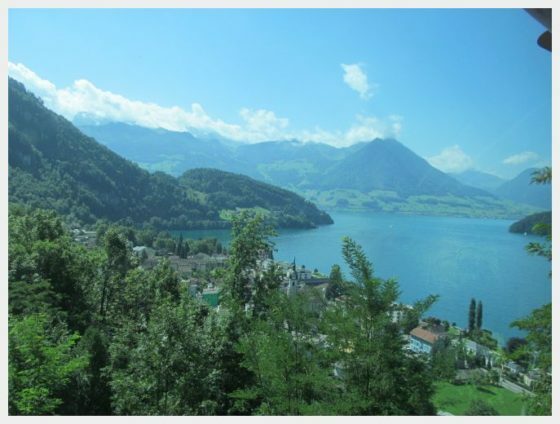 Mount Rigi is also an easy daytrip from Interlaken. If you are looking for ideas of what to do in Interlaken with kids (or nearby) this should definitely be on the top of your list! The museum features 250 traditional Swiss buildings in an idyllic mountain setting with farm traditional farm crops and gardens. 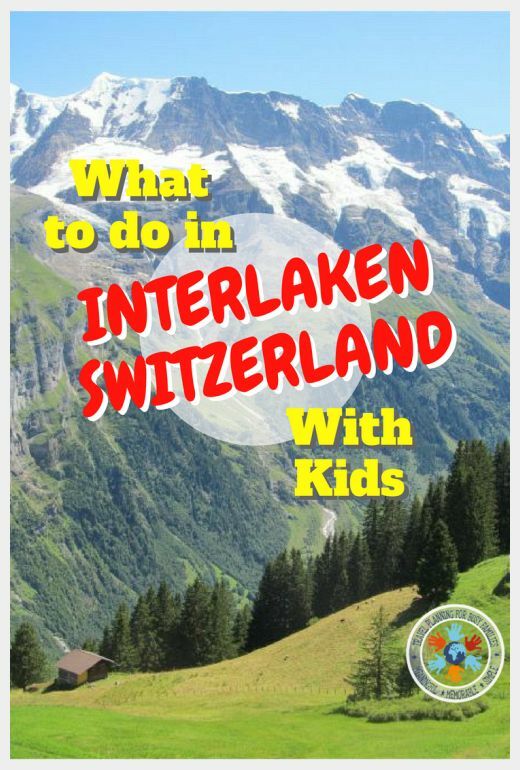 This is a really fun day out for those looking for Interlaken Switzerland activities with kids! This coupon book has a 50% off coupon good for entry into the Ballenberg Open Museum as well as a host of other discounts. This will be a nice treat if your kids are just done with mountains and cutesy little villages. This is an amusement park that has a great indoor and outdoor play area for kids as well as a variety of other shows and amusements. It is also great for those looking for an option for what to do in Interlaken with kids on a rainy day!